I dearly love these little beings. My life would be so empty without them. I found Flutter in a box yesterday. That means that Flutter and Lacy are trying to nest. I will sweep the floor again today and collect stray eggs to boil the collection for replacements. I saw something really pitiful yesterday. There was a stray egg on the floor that had been cracked. Poor little Gimpy was trying to get it under him. He tried and tried but with one crooked leg to lift him he was unable to sit on it. When he finally gave up the others went to check on the egg. I sweep the floor in that room only every 3 days to keep from upsetting the flock. With them flying around most of the stuff goes to the baseboards (seed shells). Has anyone else noticed that a hormonal bird has red nostrils. I have noticed it in all of them. - is there good air circulation in the room or do you have a good, large air purifier in there? - are they getting enough betacarotene [dark leafy greens, yellow and orange veggies and fruits]? - are they sneezing or fluffed up? tail bob? This morning I heard a little voice in the cockatiel room before day break. It said "wake up pretty bird". I did not recognize the voice. I guess one of the males finally felt good enough to talk. It has taken me all day to hold down my sorrow enough to let you all know. This morning when I went in to feed the Cockatiels, Shadow was making some strange sounds while standing near the wall. When I went over to see what he was looking at, it was Maggie. She seemed fine last night and was hanging out with the others at bedtime. She was egg bound. I don't know if Shadow did not know she was dead and tried to wake her up or if those sounds were the sounds of a Cockatiel crying. These two had their own mates but my Cockatiels are in a flock and look out for each other. 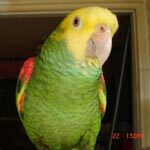 Maggie was a breeder bird that I rescued. I was going to allow her one baby to raise. She had laid eggs and hatched them but was never allowed to raise them. None of the eggs have been fertile and the flock has given up on nesting. Flutter and Lacy are the only ones that have started a new nest. So far the eggs are clear of babies. The others are back to flocking together. I am so sorry for your loss, Liz. I had not seen this before... You really need to stop thinking that allowing a bird to have babies will 'cure' them of anything. It's not really true. Birds want to breed when they are hormonal but they don't pine for babies, they are just reacting to the hormones in their blood. As to her being eggbound, don't you give them a multivitamin supplement with D3 in it? I not only give it to them all year round, I also have a separate one of liquid calcium and D3 [Calcivet] that they get in their water when the hens lay. The only vitamins they get are in their food and the chew block of calcium. I have collected 16 eggs from the floor. I don't know how old these birds are but I have not seen any fertile eggs. Pajarita, it sounds like I am not doing as much as I should but I do try. They have their light on from 9am to 5pm with natural light coming through their screened window. The evening sun comes through that window. They try to eat anything green but will eat celery. I buy the greenest I can find and put a notch in it. I usually find a little piece in the evening. They won't eat fruit except unsweetened applesauce. Romaine is out now so I have been giving them the greenest part of ice burg lettuce. I tell them they have to eat the other stuff but they do not listen. No, they certainly do NOT listen to momma telling them they have to eat all their veggie! Liz, I KNOW for a fact you do your very best by them but you NEED to give them a multivitamin/mineral supplement or you are going to end up with all your hens eggbound because there is no way on thi green earth that they are getting enough vit D3 from the open windows. ALL my birds get it twice a week but the laying hens get the extra calcivet when they lay because they use up a lot of calcium in the eggshell and it needs replacing so the other organs [and bones] don't suffer for it. Tell me what and where to find the vitamins. I will do it.